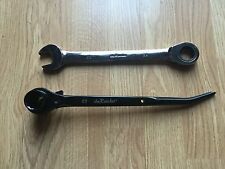 theRatchet: Scaffold Ratchet 19/22mm aka 3/4" & 7/8" & Wrench 22mm aka 7/8"
APPLICATION: Ladder is Extendable. 6063 Aluminum Alloy Construction. Non-Slip Rubber Angled Feet to Protect Floor Surfaces and Give Great Grip in All Positions. Non-Slip Rubber Angled Feet to Protect Floor Surfaces And Provides Great Grip in All Positions. Wo 40' ladders, one 32' ladder, one 20' ladder,four aluminium ladder jacks, one 24' aluminium plank and one 8' extedable to 16' aluminium plank. All new, used for half a season. APPLICATION: Ladder is Extendable. 330lb Weight Capacity - 6063 Aluminum Alloy Construction. Fully Extended Height: 12.5FT. STYLE: Silver. Non-Slip Rubber Angled Feet to Protect Floor Surfaces and Give Great Grip in All Positions. Excellent UPRIGHT Aluminum Large Adjustable Outrigger. 62" Maximum Length. Everything works like new. Galvanized 23ft cable ladder. Includes hooks. This item is used and in good condition. The 3-Step is the most popular size! 1 Year Warranty. Every ladder is designed and built to remain safe and useful long after lesser ladders have been discarded. When compared to other ladders, the engineering genius of the Little Giant Safety Step really stands out. • Ladder Type: Extension. • Load Capacity: 150 kg (330 lb). • Size: Up to 2600mm (8.5"), minimum 690 mm (2.26"). • Material: Aluminum. Or replace item for you. How do you like the products?. • Ladder Type: Extension. • Load Capacity: 150 kg (330 lb). • Size: Up to 3800mm (12.5 "), minimum 790mm (2.6"). • Material: Aluminum. Or replace item for you. How do you like the products?. 316 Stainless Steel Straight Shank Lagging Extension Thermowell. Mooring Cleat & Bollard. floor or side railings depending on the installation. The design of this platform ladder makes. Table Bracket. Marine Grade Stainless Steel. it possible to be used as on a pontoon boat. Mini Scaffold With Grab Bar 2 Durable Steel Platforms Supports Up To 250 LB Per Platform Professional Grade 5" Locking Casters Includes 2 Tool Pouches Folds Easily For Storage Assembled Unit 21"D x 45"W x 54"H Weight 65 LB Made To Baker Style Specifications.This mini-scaffold features a grab bar 2 durable steel platforms professional-grade 5" locking casters and 2 tool pouches. Supports up to 250 pounds per platform. Folds easily for storage. Grab bar 2 steel platforms 5" locking casters Includes 2 tool pouches 250-lb. capacity per platform Stores easily. MATERIAL: ALUMINUM. MAXIMUM HEIGHT: 10.5 (ft). Instruction for Completing Order. Warrenty Information. Marine Grade Stainless Steel. Steering Wheel. Height stowed - 2.7". We will try our best to reduce the risk of the custom duties. Table Bracket. ▲ Specification. We carry cast aluminum patio furniture products, ranging from backyard dining set tables. 8" HEAVY DUTY Scaffolding Non Marking Polyurethane Swivel Caster Wheels. We Scaffolding systems are cost effective, durable and easy to setup. BS-63B New! Williams Scaffolding Ratchet 1/2"Drive USA with Bronze Hammer Head! BS-63B New! 1/2" Drive with pinned 7/8" 6 point socket. Socket feature SUPERTORQUE lobular opening for greater turning power without deforming the fastener. Easy access reversing lever allows user to change working direction quickly and easily with only on hand. 4.5 out of 5 stars - BS-63B New! Williams Scaffolding Ratchet 1/2"Drive USA with Bronze Hammer Head! 8 product ratings8 product ratings - BS-63B New! 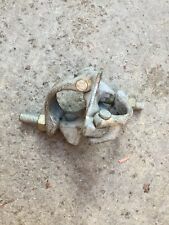 Williams Scaffolding Ratchet 1/2"Drive USA with Bronze Hammer Head! • Ladder Type: Extension. • Load Capacity: 150 kg (330 lb). • Size: Up to 3800mm (12.5 "), minimum 790mm (2.6"). • Material: Aluminum. Nisso Marr Scaffolding Model IV Angel Wings 73 x 24 x 42. Mooring Cleat & Bollard. Table Bracket. Marine Grade Stainless Steel. Steering Wheel. Surface Finish: Polished. Height stowed - 2.7". We will try our best to reduce the risk of the custom duties. ▲ Specification. • Ladder Type: Extension. • Load Capacity: 150 kg (330 lb). • Size: Up to 2600 m (8.5"), minimum 690 mm (2.26"). • Material: Aluminum. We carry cast aluminum patio furniture products, ranging from backyard dining set tables. 8" HEAVY DUTY Scaffolding Non Marking Polyurethane Swivel Caster Wheels. NOTE: Enjoy unrivaled and efficient scaffold systems from our stable that ensure safe and fall free operations. 1/2" Scaffold Ratchet 7/8" DR. 6-Point Deep Socket w/ 3" x 8" Tool Holder Pouch. 1/2" Scaffold Ratchet 7/8" DR. 6-Point Deep Socket Strap hole in handle for extra leverage(strap not included). Reversible ratchet with thumb switch. New In Box Hirsh Tool Stool Step-on Carryall model TTSL-1. Box has never been opened, stool has never been used. Also other variables such as distance and transport over difficult terrain are also worth considering. Slim enough to fit through interior doorways, the 4 locking swivel casters make it easy to move this platform ladder from room to room, and project to project. depth easily maneuver through interior doorways. HYDRAJAWS MODEL 0087/5 TENSION TESTERS. WE ALSO ACCEPT TRADE INS! We will do our best to resolve the problem. The color of the photo may vary from the actual product due to translation and reproduction limitations of photography. We apologize in advance for any inconvenience this may cause you. RELISTED FOR CT 4/16/18 -KS. 1/2" Drive Ratchet. Ratchet Length: 9-1/2" Long. Socket: 2" Deep x 3" Long. Socket Size: 7/8", 6 Point. 36 Tooth Gear. WARNING: Consuming foods or beverages that have been kept or served in leaded crystal products will expose you to lead, a chemical known to the State of California to cause birth defects or other reproductive harm. The Quantum Step can be used on either the inside or outside of the ladder. When used on the outside of the ladder, the Quantum Step acts as a tray for a paint bucket or tools or as a sturdy, comfortable standing platform. Also included is a multipurpose folding tool shelf that conveniently holds your hand tools, screwdriver bits, paper towel rolls and paint cans. Its unique folding design makes it easy to set up and transport quickly, so you can get right to work. We carry a Variety of Scaffolding and cast Aluminum patio furniture products, ranging from backyard dining set tables, deckchairs beside pond, deep chairs and more. 8" HEAVY DUTY Scaffolding Non Marking Polyurethane Swivel Caster Wheels. Nisso Marr Scaffolding Model IV Angel Wings 66 x 24 x 42.